Martyn Wade is Chief Executive Officer of Grindrod Shipping Pte Ltd which trades under two brands - Island View Shipping (IVS) and Unicorn Shipping and will in June become Chief Executive Officer of Grindrod Shipping Holdings, the new holding company, when it lists on the NASDAQ in New York. He was an Executive Director of Grindrod Ltd from November 2011 until stepping down in November 2017 in order to assume his new role with Grindrod Shipping Holdings. 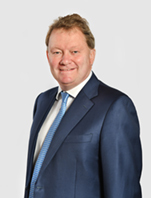 He is also a director of the UK Freight Demurrage & Defense Association (UK), a member of the advisory panel to the Singapore Maritime Foundation and a member of The Baltic Exchange having been first elected in 1979. Martyn has 40 years international shipping experience and has worked for shipowners, operators and shipbrokers in London, Johannesburg, New York and now Singapore. The companies he has worked for include Van Ommeren UK, Simpson Spence and Young Johannesburg, Clipper Bulk USA and HSBC London.